The percentage of immigrant entrepreneurs (those who own their own business, regardless of size) in the U.S. is growing. 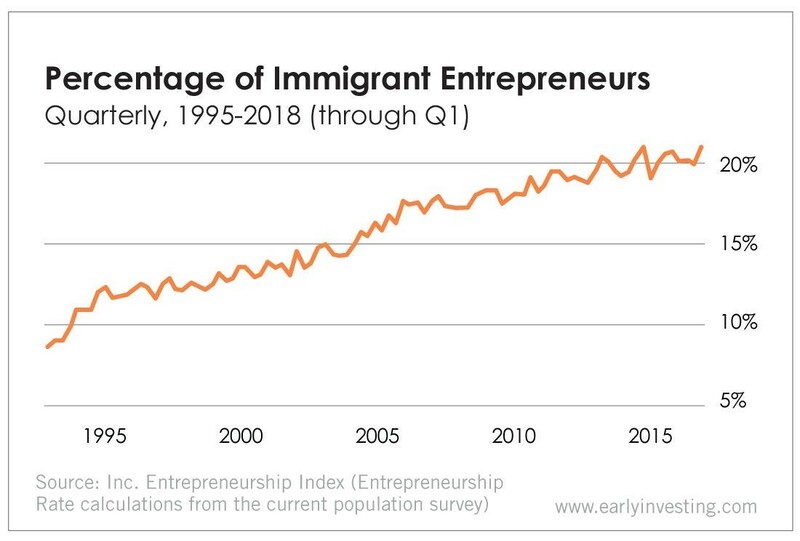 According to Inc.’s Entrepreneurship Index, the percentage of immigrant entrepreneurs has been gradually increasing since 1995. Forty-three percent of current Fortune 500 companies were founded by immigrants and their children. And as of October 2018, immigrants had founded more than half of American unicorns (companies valued at $1 billion or more). The U.S. has more immigrants than any other country in the world – more than 40 million. And America’s reputation as the land of opportunity attracts enterprising immigrants from all over the world… Tesla and SpaceX founder Elon Musk (from South Africa). WeWork CEO Adam Neumann (from Israel). PayPal and Palantir Technologies co-founder Peter Thiel (from Germany). But the U.S. has an ambivalent history of promoting immigrant entrepreneurship. In 2016, USCIS (U.S. Citizenship and Immigration Services) attempted to create a welcoming business environment for immigrant founders with the International Entrepreneur Rule (IER). The rule allows the Department of Homeland Security (DHS) to use its discretionary parole authority for entrepreneurs whose startups may benefit the American public through capital investment, revenue and job creation. Under the rule, entrepreneurs are granted an initial stay of up to two years to oversee and grow their company in the U.S. If the founder and their company continued to benefit the U.S. economy, they could be granted a longer stay. Countries like Canada, France, Germany and Singapore have put in place “startup visas” to bring new companies to their shores. The world’s best immigrant entrepreneurs now have many choices on where to start a new enterprise, and the International Entrepreneur Rule would facilitate these job creators launching a startup in the United States, rather than overseas. Further delay of IER will only harm the U.S. economy. NVCA is right. And this restriction doesn’t hurt just the U.S. economy and venture capitalists. It also hurts individual investors. For early investors, access to a wide range of quality startups is essential. And that means having access to startups with immigrant founders or team members too. Taking away the ability of overseas founders to start a business in the U.S. means investors lose the opportunity to make potentially lucrative investments. Comments on the IER removal proposal are now closed, so unfortunately you can no longer respond directly to the DHS document. But we’ll be keeping an eye on this proposal. There are companies helping to highlight or assist immigrant founders. Republic, one of the top crowdfunding portals we work with, has a special focus on underserved entrepreneurs, including immigrant founders. While browsing startups on its site, you can filter your searches with the “immigrant founders” tag. Hopefully the government takes a cue from this forward-looking attitude. If it doesn’t, the U.S. will lose potentially successful businesses to other countries. And investors will miss out.